We are trying a little experiment here. 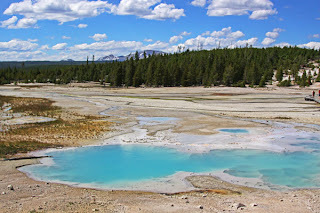 We are taking some of our favorite shots and spots from Yellowstone, and posting them here as our version of postcards. We are not sure how they will format out, but hope you will enjoy the views, and if the format is funny, just makie it a game, and try to match the words with the pictures! 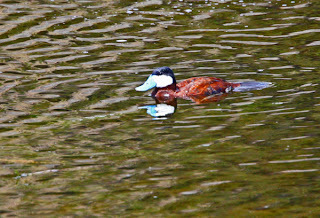 a Ruddy Duck--when we see him in Savannah in the winter he doesn't have this fancy blue bill. 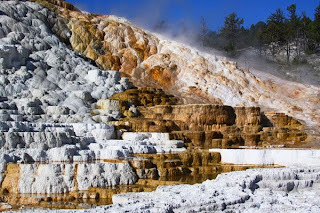 Mammoth Hot Springs--a travertine terrace. Porcelain basin, my favorite because of its beautiful pastel hues. 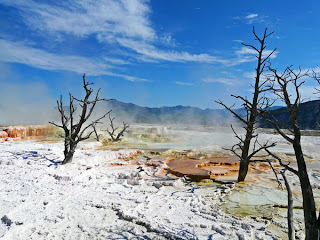 Mammoth Hot Springs--a wintry scene in travertine. 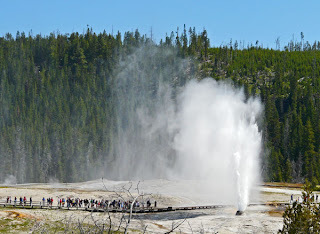 Beehive geyser erupting. (We were lucky to see this one--it does not perform on schedule. It is tiny, but mighty. 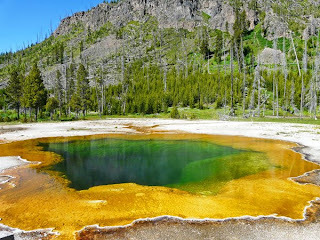 Emerald Pool, which is not only colored by the yellow sulfur, but also thermophiles, little yellow and green organisms which love hot water. 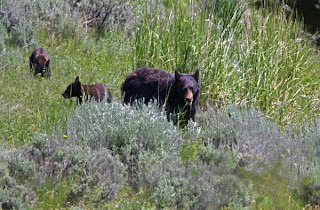 A black bear mom and her cubs. 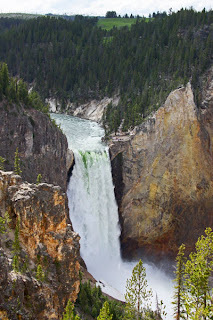 Artist's Point, at the Canyon's Lower Falls, one of the most photographed and painted spots in Yellowstone. 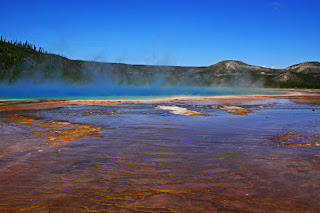 I had the thought that all your yellowstone photos, incl earlier ones of the lodge, look like postcards. 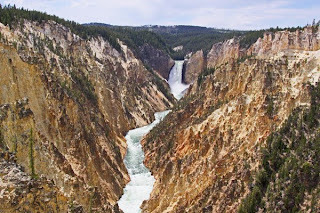 Yellowstone must be the most postcarded! I'm a thermophile too, Hot Springs is on my radar now! I'm fixin to go to NY in August, first to a lake outside Rochester to visit Margaret Hall in her summer cabin than to NYC to visit Judith P. Getting excited for several kinds of cool! Wow, these are all beautiful! You have totally mastered photography.